Sorry... the 2017 Honda Odyssey is no longer being sold as new. Instead, take the first step to a great deal on 2019 Honda Odyssey with a free price quote! The 2017 Honda Odyssey is a family minivan that seats up to eight passengers across three rows. It competes with the Toyota Sienna, Chrysler Pacifica, and Nissan Quest. This year, it remains largely unchanged. Six trims are available: the LX, EX, SE, EX-L, Touring, and Touring Elite. The Odyssey’s styling is very in-line with what can be seen on other Honda vehicles. The front-end features a bold crest-shaped grille with chrome gills that align to geometric headlights. The lower fascia is somewhat sporty, in a functional, tactical sort of way. Standard features include power side mirrors and 17-inch wheels. Xenon HID headlights, a power liftgate, power-sliding side doors, and larger 18-inch wheels are optional. Under the hood, the Odyssey is powered by a 248-hp, 3.5-liter V-6 engine mated to a six-speed automatic transmission that produces 250 pounds-feet of torque. For improved fuel efficiency, the Odyssey can deactivate cylinders during light-load operation. The Odyssey earns an EPA-estimated rating of 19/28 mpg city/highway. It can also tow up to 3,500 pounds when equipped with the towing package. 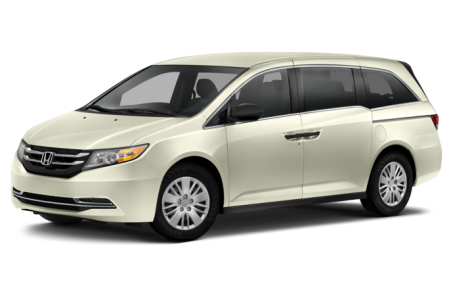 The ultimate measure of a minivan is how family friendly it is and the Odyssey performs well in this regard. Spread throughout the cabin are no less than fifteen cup holders and a plastic ring for a trash bag flips up from behind the center console to help keep the car clean. If it does get dirty, the HondaVac is there to clean things up. HondaVac has enough hose to reach all corners of the car and stashes in a cubby in the rear cargo area; it is only available on Special Edition and Touring Elite models. Seating is flexible as well with a three-piece second row in which each of the parts can move independently. The center seat can slide six-inches forward so parents can easily reach a child in a car seat, while the side seats move forward/back and can even slide out laterally for more shoulder room. The three-seat third-row is split 60/40 and can fold completely into the floor to create a flat cargo area. There is 38.4 cubic feet of cargo room behind the third row, which expands to 148.5 cubic feet with the third row stowed and the second row removed. Standard features include air conditioning, an 8-inch screen, Bluetooth connectivity, powered front seats, USB/iPod port, and cruise control. A rear seat entertainment system is optional, while Touring Elite models get a larger ultra-wide 16.2-inch display. Heated front seats, a navigation system, and leather upholstery are also available. The Odyssey earned a full 5-star overall crash test safety rating from the National Highway Traffic Safety Administration (NHTSA). Side-impact and three-row side curtain airbags are standard, along with active front head restraints, antilock brakes, a rearview camera, and electronic stability system with traction control. A blind spot warning system, expanded view driver’s mirror, forward collision warning, and lane departure warning are available. 29 of 29 (100%) consumers said they would recommend this vehicle to a friend.